Do you want to convert bulk images into one PDF document in Linux? Convert JPG to PDF in Linux please read completely this article called "Multiple Image to Single PDF Converter Software in Linux" using convert command from ImageMagick Studio LLC. 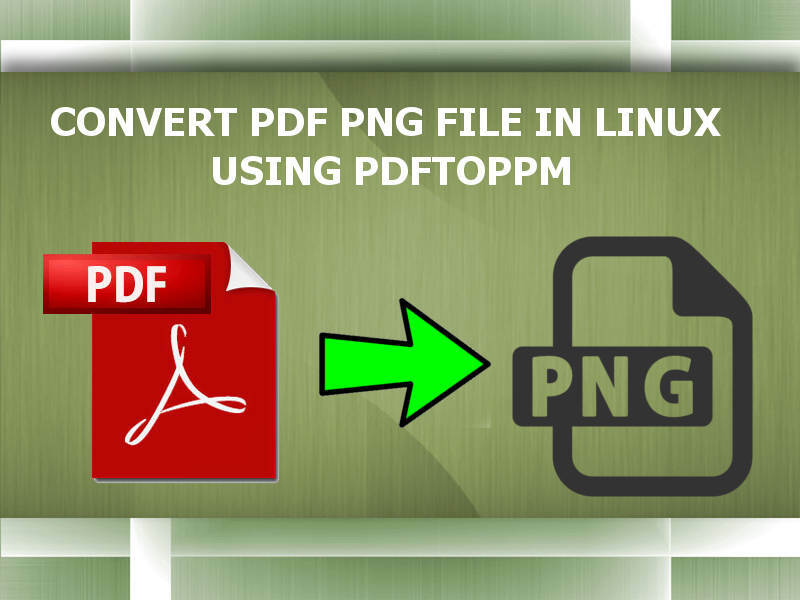 Converting bulk image format into one single PDF can be done by simple program using Linux Terminal. You can combine any image into single PDF automatically sorted by name. So if you want your photo converted sequentially you need to rename it ascendingly. 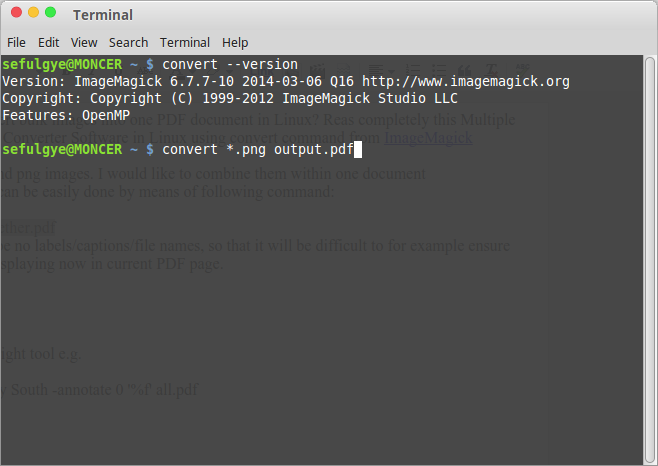 This linux program to create PDF from image called "convert". Convert is small and simple software from ImageMagic used to convert all image together into single file of PDF. ImageMagick is a command line Terminal program in Linux which is capable of so many more batch operations than this - resizing, compressing, format converting - and it's available on all platforms - Linux, Windows and Mac. Creating a PDF document from multiple JPEG/JPG/PNG images file can take some time and you may want to try different settings for size and quality of output, so we suggest you make a copy of the JPEG files in a temporary folder to play around with and use Imagemagick on those, NOT your originals. Reducing the resolution as a first step will also make things much quicker. How to Combine Multiple Image Into Single PDF in Linux ? Create a folder, and copy your image you want to convert into that created folder. Right click inside the folder on the blank area, and select "Open in Terminal"
NOTE: you can use convert *. * ouputfile.pdf instead for converting any image format into single pdf file. Have a try! 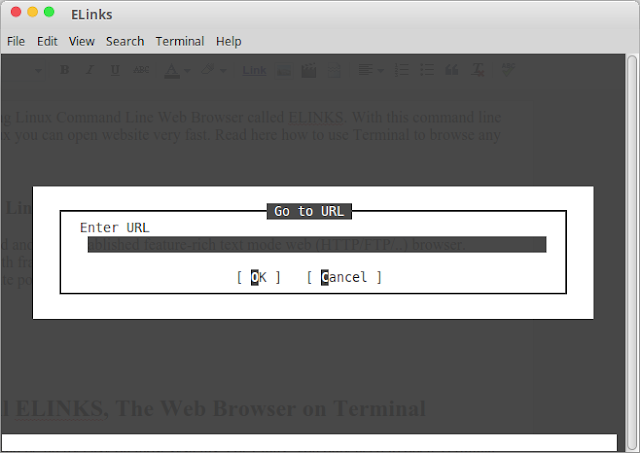 Browse Website Using Linux Command Line Web Browser called ELINKS. With this command line web browser for Linux you can open website very fast. 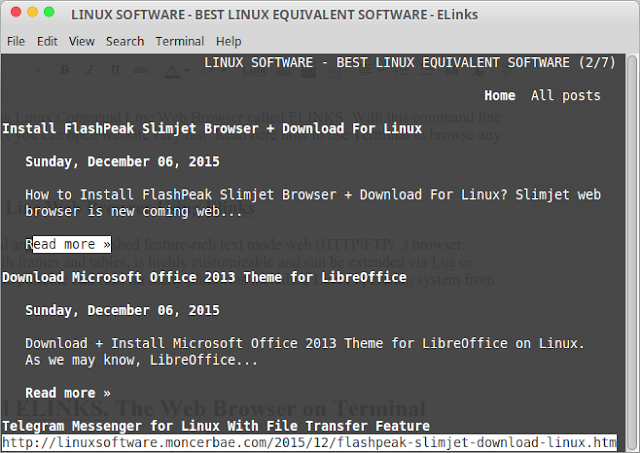 Read here how to use Terminal to browse any website Linux! ELinks is an advanced and well-established feature-rich text mode web (HTTP/FTP/..) browser. ELinks can render both frames and tables, is highly customizable and can be extended via Lua or Guile scripts. It is quite portable and runs on many platforms including Linux operating system from Terminal. 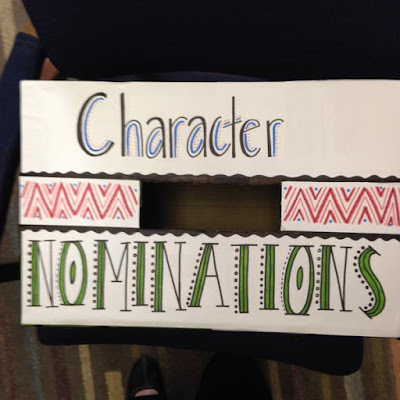 Many people would like to have a bookmark system with categories (note that ELinks already supports that, marketing name Hierarchical bookmarks), and also to be able to view them and search for them in an HTML page. I have written an alternative bookmark system (for ELinks), which some people may like better than the standard bookmark system. ELinks uses neither (n)curses nor termcap/terminfo, so unless you are using a terminal that is known by ELinks and have a built-in configuration (see below for a list), it might be required that you do a little configuring of how your terminal should be handled. The easiest way to do this is by using the Terminal Options dialog located in the Setup submenu of the Main menu. The main window will appear such as image above. Try to open http://linuxsoftware.moncerbae.com then hit enter. It will show text only for user to read the information. This web browser program for Linux to open website on Terminal is quiet good and very fast because it is load text only. No multimedia or picture will be loaded by default. For you who need text only browser, ELinks is good choice for you. Have a try! Genisoimage Software to Create ISO From File or Folder in Linux. Genisoimage is a free linux software to make iso image file from Terminal, a pre-mastering program. This guide will help you how to install Genisoimage and Genisoimage review as a free software to make an iso file for Linux. With Genisoimage you can generate ISO9660/Joliet/HFS hybrid filesystems. Genisoimage takes a snapshot of a given directory tree, and generates a binary image which will correspond to an ISO9660 and/or HFS filesystem when written to a block device. The -r and -J ensures long file names work for Unix (using Rock Ridge) and Windows (using Joliet extensions) respectively. You need to populate files you want to make iso into a folder. If you are Linux Mint users, you can right click the blank area where the folder you want to make an iso file exist, then choose "Open in Terminal". Now it is easy to create iso file because of the best software to create iso file from folder, Genisoimage. Genisoimage can generate the System Use Sharing Protocol records (SUSP) specified by the Rock Ridge Interchange Protocol. This is used to further describe the files in the ISO9660 filesystem to a Unix host, and provides information such as long filenames, UID/GID, POSIX permissions, symbolic links, and block and character device files. If Joliet or HFS hybrid command line options are specified, genisoimage will create the additional filesystem metadata needed for Joliet or HFS. Otherwise genisoimage will generate a pure ISO9660 filesystem. Tesseract OCR Optical Character Recognition Software for Linux whicn run in Terminal with command -command line OCR tool. If have scanned document of ebooks, journal, or papers and want to convert the scanner picture to text file you should you use Tesseract OCR. The Optical Character Recognition software, Tesseract OCR perform better for converting image from scanned ebook paper into txt file. So I would like to know the recommended Optical Character Recognition softwares for Linux is Tesseract OCR which is available for free. The best Optical Character Recognition Softwares is Tesseract OCR. Definition of OCR is a technology that allows you to convert scanned images of text into plain text. This enables you to save space, edit the text and search/index it. Tesseract OCR is the most accurate, under Linux now they lack graphical interface (GUI), which is a very important usability feature for a typical desktop user. The current version of Tesseract in the Ubuntu repository is a command-line-only tool. After successful installation, the command to use is tesseract <path to image> <basename of output file>. Tesseract will automatically give the output file a .txt extension. If you have installed the language specific data files from one of the tesseract-ocr-??? packages, you can give an -l option followed by the language code. Tesseract is probably the most accurate open source OCR engine available. Combined with the Leptonica Image Processing Library it can read a wide variety of image formats and convert them to text in over 60 languages. It was one of the top 3 engines in the 1995 UNLV Accuracy test. Between 1995 and 2006 it had little work done on it, but since then it has been improved extensively by Google. It is released under the Apache License 2.0. Tesseract was originally designed to recognize English text only. Efforts have been made to modify the engine and its training system to make them able to deal with other languages and UTF-8 characters. Tesseract 3.0 can handle any Unicode characters (coded with UTF-8), but there are limits as to the range of languages that it will be successful with, so please take this section into account before building up your hopes that it will work well on your particular language! NOTES: If you are not familiar with command using linux Terminal, you should install YAGF --the GUI for Tesseract OCR. ZBar bar code reader/scanner. 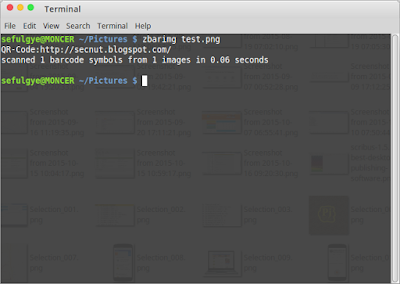 Software to Scan Barcode + QR Code From Webcam & Image File in Linux named ZBar. With ZBar you can decode barcode from file, decode barcode from webcam. Inspite of barcode you can also decode QR code from web camera also. This article will inform to you how to install ZBar and review about it. 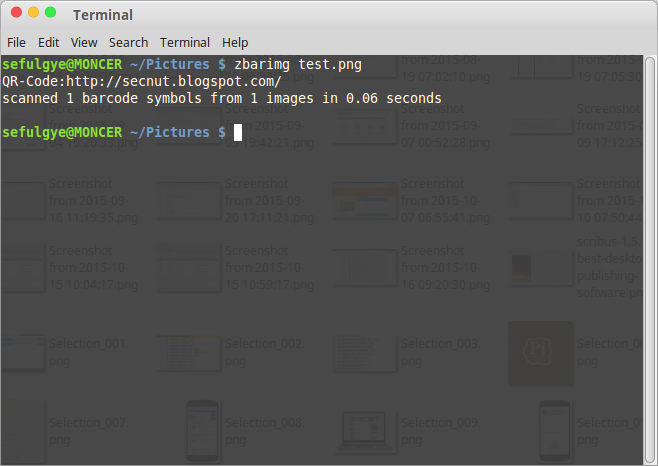 ZBar - Bar Code Reader program is an open source software suite for reading bar codes from various sources, such as video streams, image files and raw intensity sensors. It supports EAN-13/UPC-A, UPC-E, EAN-8, Code 128, Code 39, Interleaved 2 of 5 and QR Code. These are the Python bindings for the library. The flexible, layered implementation facilitates bar code scanning and decoding for any application: use it stand-alone with the included GUI and command line programs, easily integrate a bar code scanning widget into your Qt, GTK+ or PyGTK GUI application, leverage one of the script or programming interfaces (Python, Perl, C++) ...all the way down to a streamlined C library suitable for embedded use. Wait until installation completed. You can't open ZBar after install because it is a Terminal based applications. 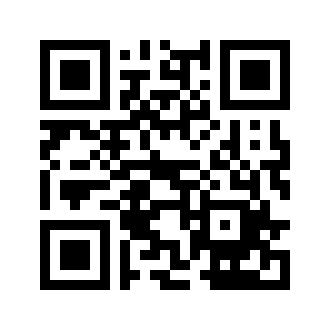 Save QR code above as "test.png" to follow this experiment!